Product prices and availability are accurate as of 2019-04-20 23:34:44 EDT and are subject to change. Any price and availability information displayed on http://www.amazon.com/ at the time of purchase will apply to the purchase of this product. Product Description Compressed air pressure regulator with gauge and installing bracket, plastic and metal construction, black red in color. Air source treatment pneumatic regulator, features 0.5-9.0 kgf/cm2 adjustable pressure range, 9.9 kgf/cm2 max pressure. 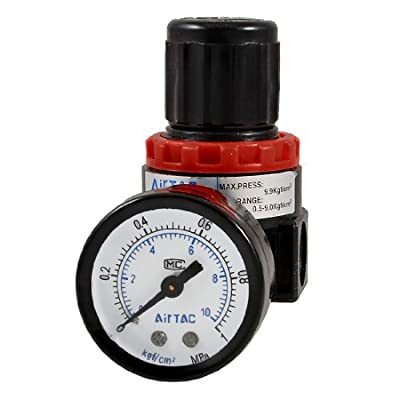 Helps regulate the pressure of air which comes from air pressure machine and provides pressure gauge clean and good air. Comes with a easy reading dual scale dial pressure gauge, the cap with a push lock is convenient for adjust the pressure.